eazy-to-rekey Ultimate Practice Lock. This is the practice lock that evolves as your lock picking skills evolve. The Ultimate Practice Locks are the easiest to re-key practice locks. 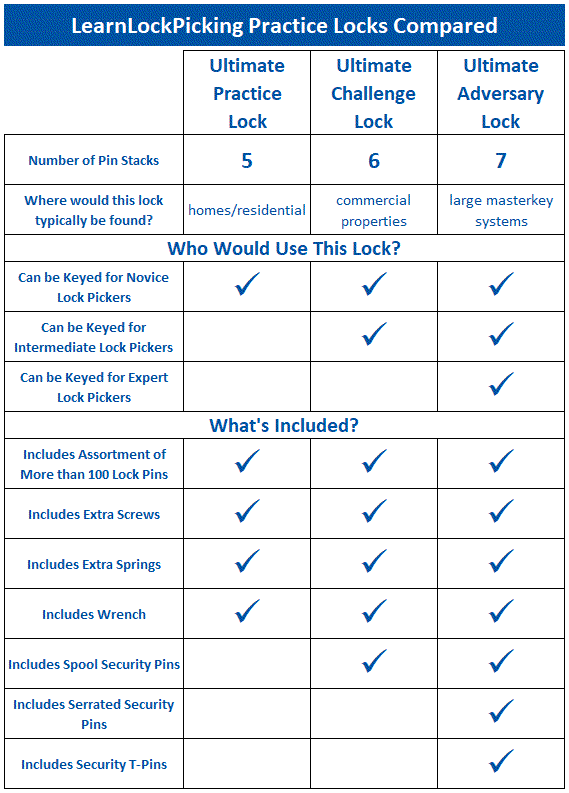 Each of our lock picking practice locks can be easily changed from easy-to-pick novice lock to high security challenge and everything in between. All three versions of our lock picking practice lock are the easiest and fastest way to master the skill of lock picking. Grows as Your Skills Grow. 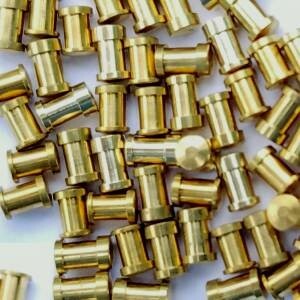 of lock picking, this practice lock cylinder can be pinned with only one or two pin stacks leaving the remaining pin stacks empty so the beginner can learn the feel of a pin stack reaching the shear line. If you have never picked a lock before, we have one of the best guides on How to Pick Locks on the internet – for free. different challenges. Thousands of possible combinations are possible including a difficult to reach around first pin or a difficult to pick hi-lo-hi-lo-hi-lo pin arrangement. The pin assortment also includes master pins to let you create multiple shear lines like those found in many commercial and institutional locks. This flexibility makes this lock picking practice lock the perfect training tool for lock sport competitions or picking hobbyists. 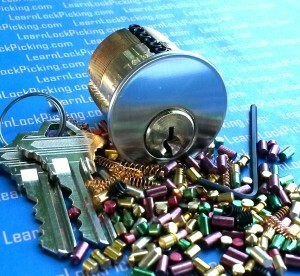 Pin stack retainer screws make it easy re-key this lock cylinder to thousands of different key combinations. An assortment of extra bottom pins, top pins, master pins, and springs is included. This is the easiest way to learn lock picking. 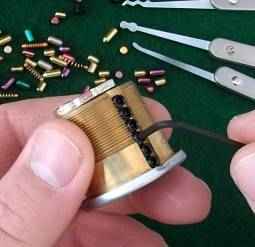 Learn to recognize the feeling of a “false set” when a spool pin binds the cylinder and how to reduce tension and rotate the lock back toward the locked position to release the trapped spool pin. You can also choose the great-grand-daddy of all practice locks, our 7 Pin Ultimate Adversary lock. This version of our easy to re-key practice lock is made with 7 pin stacks and includes three different styles of security pins: spool pins, serrated pins, and T-pins. What do you call a lock that offers the ultimate in lock picking difficulty? The Adversary! Like all of our lock picking practice locks, it can also be keyed to only 1 or two pin sacks without the security pins for the novice. This lock offers the greatest range of any lock we offer. The 5 pin Ultimate Practice Lock comes ready to pin with 5 pin cylinders. That’s 5 bottom pins of different lengths, 5 top pins, and 5 springs. The 6 pin Ultimate Challenge Lock comes ready to pin with 6 pin cylinders. That’s 6 bottom pins of different lengths, 6 top pins, and 6 springs. The 7 pin Ultimate Adversary Lock comes ready to pin with 7 pin cylinders. That’s 7 bottom pins of different lengths, 7 top pins, and 7 springs. Also included with all models are more than 100 additional top and bottom pins of varying lengths. This is enough pins for nearly 50,000 different combinations. Additional springs are included in different lengths. Short springs are to be used with tall pin stacks and long springs are to be used with short pin stacks. An assortment of master pins are also included to allow multiple master pins in each stack so you can learn to pick institutional key systems. This brings the possible combinations to just over half a million. If you choose the 6 Pin Ultimate Challenge Lock, we include more than enough spool pins to allow a spool pin to be added to each pin stack for the Ultimate Challenge. 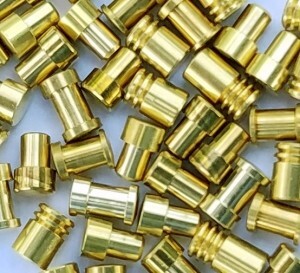 With the addition of spool pins, the possible combinations are well over 1 million. The 7 Pin Ultimate Adversary lock includes spool pins, serrated pins, and T-pins. Instructions for re-pining the cylinder and training tips are included. All of our easy to re-key practice locks eliminate the usual disassemble, plug followers, tweezers, and difficult access to pins and springs that other lock cylinders require. 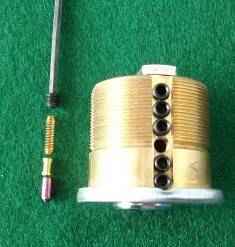 This lock cylinder has been modified so that each pin stack can be accessed from the top by removing a retaining screw. A hex wrench for removing these screws is included. Changing a pin stack is as easy as removing the screw and dumping the existing pin stack into your hand. A new pin stack is dropped in pin by pin. Bottom pin first, master pins if desired, a top pin or spool pin, and the spring. Finally the retainer screw is replaced. Extra retainer screws are included. Purchase one of our practice locks here.